Announcement from L. Ross Babcock III, July 2018 – FASA Games, Inc.
Twenty-six years ago, we at FASA Corporation started to think about what our next game might be. After several months of deliberations, the concept for Earthdawn was agreed upon, and the writing and production of the game started. By Gencon 1993, we were ready and Earthdawn was released with a cool red leatherette cover as the limited edition. FASA released 30 or so Earthdawn products over the next few years and ended production in 1996. Enter Living Room Games; they acquired a license for Earthdawn and continued to tell the story. In 2001, as FASA Corporation was in the process of ending operations, Redbrick acquired the license and continued to publish their various editions until 2012. In that year, FASA Games, Inc. was started to carry on. Our Kickstarter campaign to re-introduce Earthdawn in a new Fourth Edition was wildly successful, and we have been steadily releasing the core books and supplements ever since. 2018 is the 25th anniversary year of the release of Earthdawn! We hope there will be many, many more anniversaries to come. Our plans for Earthdawn are to continue the original story and to perhaps touch on a few things that players of other, related games might recognize. We will start to detail regions outside of Barsaive and continue to provide the information on the objects, items, and rules that help make Earthdawn unique. 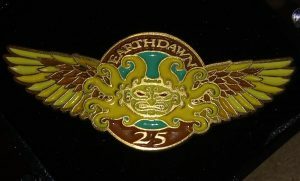 To celebrate Earthdawn’s 25th anniversary, we have created a commemorative pin. Those attending Gencon can come by our booth to purchase one. Our long suffering Kickstarter backers will also be sent one. For those of you not able to attend Gencon, any remaining will be available for sale on our website after the convention while supplies last. Thank you for all your support; past, preset, and future! FASA Corporation & FASA Games, Inc.